I am a complete sucker for anything holiday-related, especially in the Fall! So after planting some fall mums, raking the leaves off the deck, and prepping our giant pumpking for carving this weekend, LG and I traded in the usual toys for a whisk and measuring cups while making this yummy and kid-friendly recipe for pumpkin cream cheese muffins. Growing up, my Mom made (and still makes!) the very best pumpkin bread. From October 1st to New Year's, our home almost always smelled of delicious pumpkin bread. For breakfast, we got a break from the usual cinnamon toast (also delicious) and enjoyed a slice of Pumpkin Bread slathered with cream cheese. Friends and family begged for her recipe and came running to our house on the weekends for this cozy meal or snack. The cream cheese changes the game completely and if you've never done it, I recommend it! 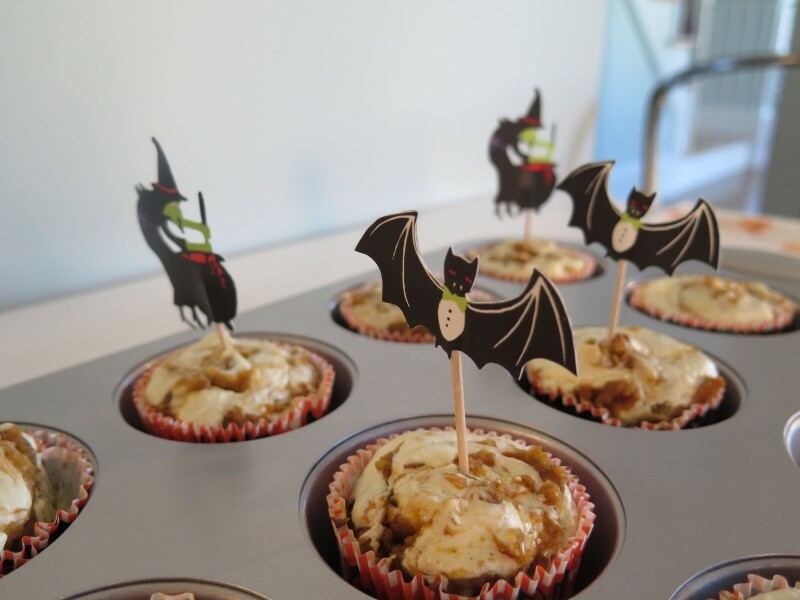 This weekend, I really wanted to bake some pumpkin goodness but I also wanted to use the super cute halloween-themed cupcake cups and toppers I got from the store. Enter The Novice Chef, otherwise known as Jessica Segarra! I found this most delicious recipe on her blog and man oh man, did she deliver. It takes the pumpkin bread and cream cheese combo and combines it with the easily transportable muffin size! It's a win-win for everyone, especially in a house with a toddler. Here's how they're made. 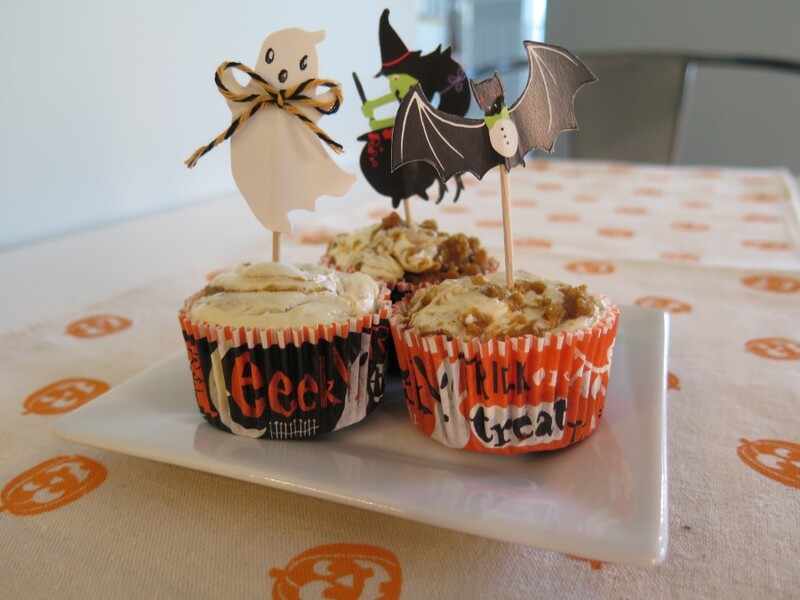 Read more about the Pumpkin Cream Cheese Swirl Muffins on The Novice Chef. One of my favorite parts about making muffins and baking in general is that there are so many opportunities to include LG. I typically fill the measuring cups and I let her help me dump them into the bowls. She also gets the first stab and stirring things up. Preheat oven to 375°F. Place paper baking cups into muffin pan. Set aside. In a medium bowl, whisk flour, pumpkin spice, baking soda and salt until well combined. Set aside. In large bowl, whisk together pumpkin, sugar and brown sugar. Beat in eggs, vegetable oil and vanilla extract. Slowly whisk in the flour mixture, until there are no lumps. I actually did this with a whisk and it blended super easily, but if you have a hand mixer, you might as well pull it out for this because you'll use it for the cream cheese mixture. Fill muffin tins 3/4 full. In a medium bowl, beat cream cheese until smooth. Add in sugar, egg yolk and vanilla extract and beat until well combined. Bake muffins for 18-20 minutes, or until a toothpick inserted in the center comes out clean. Do you have any kid-friendly recipes to share? We'd love to hear about them in the comments. Morgan Burke is the CMO of Green Piñata Toys. 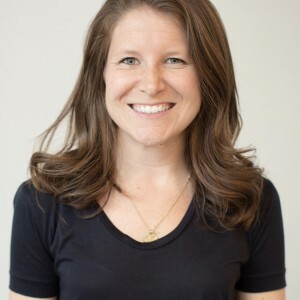 She joins us from the likes of Care.com and Fatherly, where she helped build parenting communities grounded in valuable resources with a healthy dose of humor. Morgan is a city mom, marathon runner, wannabe yogi and an absolute tornado in kitchen. She shares her minimalist aspirations and journey through motherhood in the city here on the Piñata Blog. She'd love to hear from you at morgan@greenpinatatoys.com. Sign up for our newsletter to receive insider discounts, our best tips on parenting and early education, and 20% off! No thanks! Let's keep playing. © 2019 Green Piñata LLC. All rights reserved. What’s special about this toy?